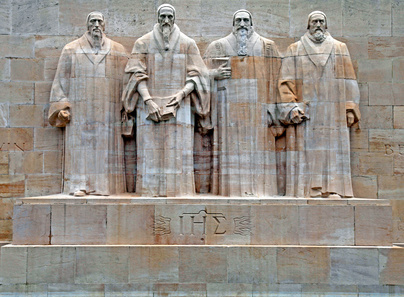 Over the years, I have read a few of the reformed confessions and catechisms. I have even taught the Shorter Catechism to children in Sunday School. I recently read an article by Tim Challies titled, Use Your Catechism, Silly. It in, he extols the virtues of using these resources to understand and evaluate contemporary matters of faith and practice. It may surprise you to learn that some church fathers, as well as Reformed catechisms, have a lot to say to us today about money and stewardship. The issue of the proper place and use of money in the Christian life has always been a pretty hot topic among believers. Money has always been an issue in the church, and passionate teaching and preaching on it has not diminished over the past 2,000 years. Almost all famous historical church leaders have addressed the proper use of money and stewardship by Christians. And, there are some dominant themes that emerge, which are not necessarily consistent with what is taught in many churches these days. What is being promoted in many churches is the increasingly popular contemporary theology of money known as the “prosperity gospel,” also known as the “name it and claim it” or faith movement. In this article, I provide an overview of these historical teachings. I’ll let you decide if my comment about their inconsistency with some of the more contemporary theologies of money is accurate or not. I will also discuss what we can learn from them as we try to practice wise retirement stewardship. Not surprisingly, the church fathers didn’t write or teach about retirement. That’s because retirement as we know it didn’t exist in their time. Most people worked until they died, and they tended to die young. It was retirement with a capital “R.” They did, however, have a lot to say about money and possessions that is relevant to us today. Augustine has perhaps more than any other theologian, laid the foundation for much of modern Christian theology. He approved of working for the use and acquisition of material wealth, possessions, and private property so that a man could meet the needs of his family and others who could not care for themselves. Augustine said that such things were “good,” depending on how one acquires them and uses them once acquired. He differentiated between needs and wants, and was quick to condemn the excessive and superfluous. Augustine had a keen focus on the respect and dignity of others, and the requirement of the believer to seek to help the poor and meet the needs of other human beings. Regarding the Protestant reformers, Martin Luther, who was the catalyst of the Protestant Reformation, was strongly opposed to the self-indulgence he observed among the nobility and middle class of his day, which seemed related to his rebellion against the Catholic Church. John Calvin, one of the great Protestant reformers and author of Institutes of the Christian Religion, the standard of orthodox Protestant belief in Reformed churches, is a historical leader of the church who had much to say about material possessions. Calvin filled his works with exhortations for moderation and self-denial on the part of believers. Although he approved and appreciated inherited goods and such things as music and fine wine (some say he brewed his own beer) he stood opposed to a life of luxury. Like Augustine, he believed that temporal goods should be devoted not only to God but also to the common good through acts of charity. Then we have Jonathan Edwards, one of our great theologians and one of the men used by God to bring about the Great Awakening in America in the 18th century. He, like Luther and Calvin, often focused on the topic of wealth, but he mainly preached about forsaking all to follow Christ. Edwards did not teach that money and possessions were “bad,” but that believers must be willing to leave them for the sake of Christ. This idea reminds us of the story of the rich young ruler in Mark chapter 10. It wasn’t that Jesus necessarily expected him to sell everything and follow him, but rather that he was willing to do so if necessary. Lastly, a person of note is Charles Spurgeon, England’s best-known preacher for the second half of the 19th century. It is with him that we see teaching on money focused more on stewardship than anything else. According to him, each believer is “entrusted with a certain amount of talent, and strength, and influence, and we have to use this trust with a single purpose.” He believed that the steward’s sole responsibility was to represent his master and his business is to disperse the master’s goods according to his design. The steward is to seek the Lord’s glory with their whole heart and promote his honor. If a believer’s commitment and devotion are true, then all his gifts are from the Lord and for the Lord. That was then; this is now, right? The remarkable thing about the church fathers’ teaching is about how different their lives were from ours. They lived in times of no modern conveniences when intense labor and drudgery was required just to maintain daily existence. Their lives were infinitely harder than ours, but still, they preached, believed and practiced moderation and self-denial. I am inclined to wonder, “moderation and self-denial of what?” They already had very little, but even in relative scarcity, they were very aware of the power of possessions and money in the life of the believer, and it wasn’t necessarily a power for good. These days, in the contemporary church, not much is said about moderation. Our lives are so much easier than ever before in history, and virtually all our needs and most of our wants can quickly and easily be satisfied. Sure, we may struggle at times, financially, physically or emotionally, but not in the same way as the generations before us. Certainly not like the early Church. And not even like many of our brothers and sisters in other parts of the world. Despite all our ease and prosperity, most of us do not live in moderation unless we are forced to due to job loss, a major medical event, or some financial catastrophe. Nor do most of us know what it is to live in self-denial for the sake of God’s kingdom. You won’t find much teaching from the earlier church fathers on the more modern idea of stewardship, and you also won’t hear much about prosperity or voluntary poverty theology either. Instead, most taught moderation, self-denial, and charity, while condemning luxury, waste, or considering money our personal possession. For most of the Church’s history, at least until the industrial revolution, the church had a pretty standard message on the right use of money in the Christian life, but it is a message that you don’t hear as often today. The church fathers challenged believers to put their money to good and godly use, motivated by love of God and neighbor, and to avoid greed at all costs. It is teaching that has all but disappeared over the last one hundred years that we are all in desperate need of rediscovering and hearing afresh. Fortunately, there have been many in the churches who have taken up the mantle for this kind of teaching, men like Larry Burkett, Randy Alcorn, John Piper, Jaime Munson, Howard Dayton, and others. Others, like Dave Ramsey, Ron Blue, Matt Bell, and Austin Pryor have provided practical guidance based on biblical principles. Regarding money and stewardship, the answer to this question has much to tell us. The most significant aspects from Sonnenberg’s modern version of the catechism are as follows (in italics). My embellishments are not italicized. Giving and lending. “We should give and lend freely, according to our ability and the needs of others.” Giving and generosity is a Biblical theme and begins with the heart based on a genuine concern for the needs of others. We give because God, in Christ, has been so generous to us, and also by giving we imitate God himself. Interesting, this does not forbid lending; those who are in a position to lend can be a blessing to others. However, borrowing is discouraged in the Scripture, so the borrower should repay what they owe as soon as possible. Attitude toward worldly possessions. “We must moderate our judgment, will, and inclinations about worldly goods.” Implied in the eighth commandment along with the rest of Scripture, is the idea of personal property. Communal goods, especially as taught in communist ideology, are not taught in Scripture. Scripture also instructs us that worldly possessions can be a blessing and are a gift from God. But if we love them too much, we have committed the sin of idolatry. Stewardship of what we receive. “We must exercise prudence in the acquisition, maintenance, use, and disposition of the things that we need and are appropriate to sustain us as humanly and that match our condition in life.” We must not squander God’s good gifts. We are stewards of what God has given us. He wants us to use our possessions wisely. Good stewardship is not easy in our day, mainly because we have so much. If we were scraping for food, we would not be as tempted to throw food away. If we had no easy way of getting a winter coat, we would save until we knew we could buy one before January. But few, if any of us, are in this scenario. We can waste and still pay the bills, have warm clothes, eat excellent meals, etc., so we must be very careful. Hard work. “We should find something lawful to do in life and work hard at it.” We are to work at our vocation, whether a job or a career, as unto the Lord. Work is the primary way God provides for us and enables us to provide for our families. Also implied here is complete honesty in all our business dealings whether formal or informal. We must keep our financial promises no matter how small. Things like theft, lying, cheating, deceit, or swindling can never be accepted, especially in our business dealings with others. Frugality. “We should be frugal.” A level of frugality can promote the proper use of our resources. But there is a danger here as well. Frugality can be a cover for our love of money. We can put our frugality in “righteous” terms. We are “good stewards.” We are “wisely” using our money. We quote Bible verses about how important it is to be prudent with our money. And all this is true. But our hearts are easily deceived. Too many people claim to be careful with their money when the truth is that they are greedy and rarely sacrifice for others. They carefully manage their money not to give more (Eph. 4:28), but to protect themselves from difficulty or harm. Unnecessary lawsuits. “We should avoid unnecessary lawsuits.” Most disputes between Christians should be handled outside the courts, in accordance with Matthew 18. Acquiring wealth. “We must do our best, by all just and lawful means, to acquire, preserve, and increase our own and others’ money and possessions.” We must make our acquisition of wealth honestly, and we have a responsibility to grow what we have based on the other requirements of this commandment. It is not mainly to improve our comfort and ease, but rather to have more to share with others in needs and for use in building the kingdom of God. So how might these teachings apply in the context of retirement stewardship? Well, although retirement as we know it wasn’t in view when the catechisms were written, the principles they teach are timeless and can be applied in our time as well. First, tithe to your church. Whether you are young, getting closer to retirement, or have retired, giving money to the Lord and His church is good stewardship. If you reject the idea of the tithe, then just give. I suggest that 10 percent is a good place to start. You are free to give more or less, but if you start splitting hairs about Old Testament versus New Testament, or before taxes versus after taxes, you have missed the whole point. Second, be generous beyond the tithe. Perhaps you can give more to the church (where most of our giving should go), or you may want to give to other ministries beyond what you give to your church. If you control your spending and live below your means, you will probably have something left over after you pay the bills. We are tempted to spend more on ourselves. It’s okay to do that in moderation as many things are not “bad” in themselves, but we should consider increased generosity too. Can you give 15 or 20 percent to your church? Do you know someone who needs help? How about a mercy ministry or abortion rescue ministry you can support? It’s okay to enjoy God’s blessings, but they are not just for your enjoyment and benefit. Third, work hard so that you can earn what you need to pay your bills and provide for your family. There is a balance between living too luxuriously and being too stingy. Frugality is good, but you can get carried away with it. Provide well for your family, but that doesn’t mean they need a $60,000 BMW and a 6,000 square foot house. But it also doesn’t mean eating rice and beans five nights a week (unless you are on the Dave Ramsey snowball debt repayment plan, of course.) Consider a cap on your standard of living that is reasonable for your family, and then use the rest to further the Kingdom of God. If you do this, you will have more leftover to give and to save, in that order. Also, consider what kind of “work” you will do in retirement. It doesn’t have a be a full-time job for pay, just something productive that you enjoy, perhaps something that serves others. Fourth, enjoy the things that God has blessed you with, but hold on to them loosely. Don’t let the desire for a bigger house or a new car cause you to borrow needlessly or to spend more than you make. You don’t want to go through life with debt and you certainly don’t want to go into retirement with a load of it. But most importantly, don’t let your “stuff” steal your heart. Remember that only God can truly satisfy all the longings of the human heart. Realize that all that God has given you is for your good and His glory. Fourth, save for the future. A wise steward saves money because he knows things go wrong. Cars break down. Water heaters burn out. Jobs are lost. The steward also saves for needs that he knows will come up in the future, like retirement. But no matter what, do not hoard. That is the opposite of faith-filled saving that honors the Lord. Why is generosity ahead of saving? Because generosity is the priority that has been established in Scripture. As long as you’re not trying to be generous while spending the rest of your money with little thought or wisdom, you should be able to be generous and still save. Fifth, recognize that you have a responsibility to grow what you have received. The Catechism talks about increasing your own, and others, possessions. This is NOT about greed. It is about being a good steward and not being negligent in attending to your money and possessions. I think part of this involves wise investing principles based on a “slow and steady” approach that does not include excessive speculation and risk. Finally, always remember that all that you have – your money, possessions, skills and talents, and time – all belong to God. Therefore, your first and highest good is to use them for God’s glory and the good of others. This applies before retirement and when you are retired – you never stop using God’s gifts to serve Him.